"The definitive exploration of an undefined mystery. Like Kafka, without the optimism and maudlin sentimentality." "TITLE 13 is a darkly comic story for our time, a mélange of 'Barton Fink,' 'Office Space,' and Kafka, a novel that examines our alienation from one another and increasingly, our own country. Michael A. Ferro is a young writer on the rise." "Michael A. Ferro writes about alcoholism in a way that mimics the disease. Sometimes funny, sometimes sad, TITLE 13 is always a revelation: of our fears and anxieties, and the madness in which we might all get caught up if only a little something goes missing. Don't misplace this impressive debut." "TITLE 13's protagonist finds himself in some very dark places; partly due to vodka, and also because of the Orwellian nature of his job working for the government. And things do indeed get a little 1984-ish..."
"Rich in dialogue and description with a delicate balance of foreboding and satirical humor, TITLE 13 serves to caution all of us in the trust of our hearts, our memories, and the supposed security guaranteed by government and technology in the hands of fallible citizens." “TITLE 13 is a dive into a depraved and yet likeable mind more than it is a mystery. While the missing documents are always a looming concern, the novel is more a depiction of a troubled mind than a troubled governmental agency. We follow Heald through the city of Chicago and to his home in Detroit, painting a picture of a slow-moving, Midwestern region mostly devoid of the technological annoyances that dog us today. The story is not a thriller in which there is a prominent and clean conclusion; it is more satisfying than that. Instead, we follow a government employee who doesn’t trust the agency and yet more importantly, doesn’t trust himself…. "TITLE 13 blends a hilariously absurd world of white-collar bureaucracy with the intense emotional realities of loss and longing. 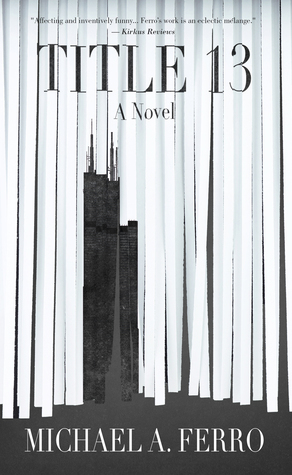 At the heart of this energetic novel and its darkly painted Chicago skyline is the throb of addiction. Ferro bravely puts his finger on that pulse and never shies away from its pain, from the lies we tell ourselves so that we can keep reaching toward a distorted sense of normalcy." "Picture some Kafkaesque bureaucratic fever dream set in quasi-contemporary Chicago and suburban Detroit. Then go drunkenly in search of something like love and something vaguely akin to those 28 conspiracy-inducing pages withheld from the original 9/11 Commission Report. Chase all this with a killer hangover worthy of Richard Yates and you'll get a sense of Michael A. Ferro’s vivid and yearning debut novel, TITLE 13. But rest unassured. Any revelations you encounter — authoritatively written, funny as hell, wonderfully worthwhile — will be sadly, and suitably, short-lived. By turns earnest and ironic, also paranoiac, alcoholic, and elegiac, TITLE 13 is a critical excerpt pulled straight from the ailing heart of Middle America." Named as a "Best Book of 2018" by the Emerging Writers Network! ​"Affecting and inventively funny... Ferro’s work is an eclectic mélange." "TITLE 13: A Novel is frighteningly realistic and pairs an unexpectedly wry, ironic sense of humor with an observational piece about mental illness, government operations, and societal fragility. Given the current political climate in Washington and its serious implications, it's impossible for even the most concerned citizen not to find continuous insights, hilarious moments, and a resonating force within TITLE 13. Like a horrific accident, it draws spectators who might feel unwilling to observe, on one level; yet who are fascinated, on another. It's this ability to draw that blend of concern, horror, and insight from his readers that keeps Michael A. Ferro's story the perfect example of a individual and political crash in the making, mirroring modern events from a delightfully fresh series of changing perspectives. Readers who enjoy stories of political and individual blundering and irony should run, not walk, to TITLE 13: it's a hard-hitting story wrapped in a unique voice that makes it nearly impossible to put down." "With fierce wit and precision, Ferro paints a riveting portrait of a mind unraveling—ravaged by addiction, and rattled by the paranoia lodged in the beating heart of our government and seeping out into society. The gripping mystery driving TITLE 13, and the deeply troubled yet often hilarious psychology of the novel’s protagonist, are mesmerizing and brilliantly rendered. Ferro is a writer in possession of rare and unique talent—wise, agile, and bold." Michael's Pushcart Prize-nominated short story, "Industry & Idleness," appears in Issue 16 of Crack the Spine Literary Journal. Click the photo to purchase the print issue! "If Joseph Heller had sat down to write And Then We Came To The End, he would've produced TITLE 13. Michael A. Ferro's prose is fluid, his insights are sharp, and his humor is redeeming. This book is a required read." ​"Michael A. Ferro writes some funny dialogue. Dark as hell, but funny. He boldly took this novel in a direction I was not expecting at all and nailed it... (Ferro's) debut shows off his understanding of human nature and the situations we find ourselves in... There must be three or four unpublished novels in drawers and closets in Michael A. Ferro's house because TITLE 13 does not at all feel like a debut." ​"Michael A. Ferro’s grand first novel churns fiction with a striking realism, and in his doing so, Ferro has successfully brought the Midwest back onto the literary map." "Exploring themes of addiction, loneliness, self-protection, and the facade we present to the world, TITLE 13 packs a much bigger punch than I originally expected. The best of authors would be hard-pressed to write such a painful account of a life slipping into alcoholism, but Ferro does a beautiful and wholly devastating job. Heald's story carries with it an urgent hope of redemption; it's intense, but Ferro will hold your hand to the end. Do not miss this gorgeous read. " "A wonderful experience and a terribly compelling character study... sometimes fun, sometimes dark, and always knowledgeable about Chicago and about people. For a first-time novelist, (Ferro is) very knowing about the emotional territory of life. A very, very ambitious book." ​"Ferro is a creative force to be reckoned with. TITLE 13 is a masterpiece of precision and vision, blended with a healthy dose of satire and wit. Echoes of Bradbury, Orwell and Huxley. As timely as it gets!" A timely investigation into the heart of a despotic faction within the government, TITLE 13 deftly blends satirical comedy aimed at the hot-button issues of modern culture with the gut-wrenching reality of an intensely personal descent into addiction. Heald Brown might be responsible for the loss of highly classified TITLE 13 government documents—and may have hopelessly lost himself as well. Since leaving his home in Detroit for Chicago during the recession, Heald teeters anxiously between despondency and bombastic sarcasm, striving to understand a country gone mad while clinging to his quixotic roots. Trying to deny the frightening course of his alcoholism, Heald struggles with his mounting paranoia, and his relationships with his concerned family and dying grandmother, all while juggling a budding office romance at the US government’s Chicago Regional Census Center. Heald’s reality soon digresses into farcical absurdity, fevered isolation, and arcane psychological revelation, hilarious though redoubtable in nature. Meanwhile the TITLE 13 secrets remain at large, haunting each character and tangling the interwoven threads of Heald’s life, as the real question looms: Is it the TITLE 13 information that Heald has lost, or his sanity?